Simply, legislative process means the steps required for a proposed bill to become a law, but the whole process includes much more than what happens in Congress. At the federal level in the United States, this process has six major steps. First, a written draft of the proposed law, called a bill, is sponsored by a member in one of the two houses of Congress—House or Senate—and recommended for consideration. The presiding officer of the house puts the bill on the agenda and assigns it to a standing, or permanent, committee for consideration. The standing committees consider all bills and oversee government actions on specialized issue areas. In the House of Representatives, committees that deal with environmental issues include the Agriculture, National Security, Resources, Science, and Appropriations Committees. In the Senate, standing committees relating to the environment include Agriculture, Nutrition and Forestry, Energy and Natural Resources, Environment and Public Works, and Judiciary Committees, although others in both houses may also consider related issues. Within the standing committee, the bill goes to a subcommittee to study and modify; here, the bill is debated and edited in a line-by-line, and often word-by-word, manner, with the agreed upon changes literally written on the original draft bill. Once modification is completed and the subcommittee and committee approve the bill, the committee sends the bill back to the full house for floor action, or more debate and a vote, this time will all the members of the house participating. After a bill passes in one house (gets a majority of "yea" votes), the bill is sent to the other house of Congress where the process begins all over again. Because of this process, it is unlikely that both houses will approve identical bills. However, when both houses have recommended a bill on the same issue, the two versions are sent to a conference committee of members of both houses, where the differences are discussed and argued over. If the conference committee arrives at a compromise bill, that bill is sent back to both houses for approval. When this last legislative approval is obtained, Congress sends the bill to the president for approval or rejection. If the president agrees with the provisions of the bill, it is signed, and the bill becomes a law. However, if the president disagrees with the provisions in a bill, the bill will be vetoed, and a veto message will be sent with the bill back to Congress. Congress can override a presidential veto with a supermajority vote, or a vote in support of the bill by two-thirds of both houses. The more complex legislative process begins before Congress drafts a bill and ends after legislation is signed. Other governmental institutions are involved, including various executive branch agencies, such as the Environmental Protection Agency (EPA). Outside government, other actors, such as the media and interest groups, are also involved in lawmaking. These external, unofficial actors help to mediate the political dialogue about what government should do. Mediated politics occurs when there are institutions or individuals who carry the message between an individual and the representative, telling government what the public prefers. Legislative representatives receive messages in various forms from individuals (as letters, votes, and contributions), as well as from media reports and editorials, public opinion polls, political parties, lobbyists, and interest groups . Taken together, these convey what it is the public wants on an issue in addition to the level of interest. If an issue and opinion on it are compelling enough, then one or more legislators will introduce a bill in one of the houses of the legislature, and lawmaking begins. Once a bill is passed by both houses of Congress and signed by the president, it goes to an executive agency where another part of the process begins. The agency creates a way to implement the policy, often by writing rules and regulations, stated in the law. Rule writing is based on implementation guidelines established in the Administrative Procedures Act, which include holding public hearings for citizen feedback. The legislative process ends here with an implemented and enforceable law. Some members of society may be negatively affected by new legislation. These individuals may form interest groups, write their legislators, or go to court in order to get the law changed. 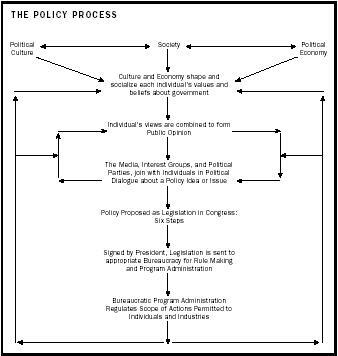 This is where the policy process starts and where active citizens dissatisfied with what the government is, or is not, doing ask for a change in policy. SEE ALSO P UBLIC P ARTICIPATION ; P UBLIC P OLICY D ECISION M AKING . Douglas, Arnold R. (1990). The Logic of Congressional Action. New Haven, CT: Yale University Press. Downs, Anthony. (1972). "The Issue-Attention Cycle." The Public Interest 28 (Summer):38–50. U.S. Congress. Legislative Process—How a Bill Becomes a Law. Available from http://www.house.gov/house/Tying_it_all.html .